Revenge is the name of the game, both figuratively and literally, in this follow-up to Criterion's breakthrough sports car racer, Burnout 3: Takedown (truly a "smash hit"). 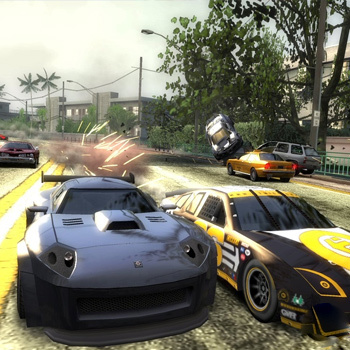 As in its immediate predecessor, offensive driving and spectacular crashes are the focus of Burnout: Revenge, and this fourth game in the series is designed to offer more avenues to destruction than any of its predecessors, by featuring a greater capacity for real-time damage and car deformation, multilevel track layouts that allow players to ram their opponents from below or above, as well as from behind or in front, and a new "revenge meter" that encourages players to pay back -- with interest -- those who wrong them on the roads. Wreckage-prone racing occurs all around the world in this edition of Burnout, in areas inspired by real-world cities, such as Detroit, Rome, and Tokyo. A number of online modes are included as well, for properly equipped gamers who are raring to test their destructive driving skills against other human opponents.